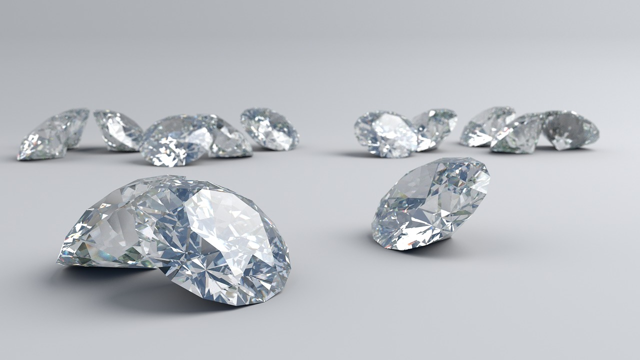 Finding hidden gemstones in target term CEFs. Target term CEFs with targeted maturity have significantly lower duration (interest rate) risk. Avoid the lumps of coal! 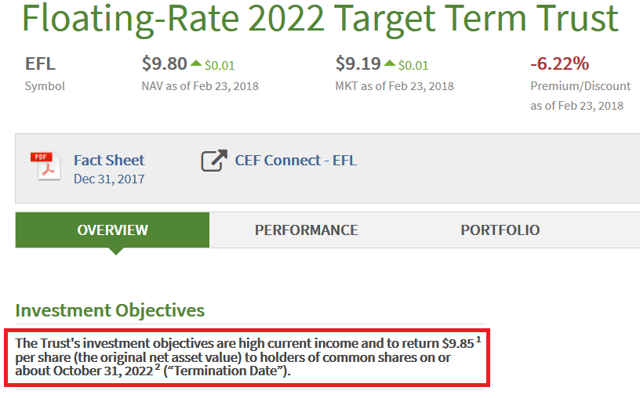 As I have explained before, I'm attracted to target term CEFs because of their defined term limits. These are funds that are set to liquidate, or convert to an open-ended structure, at a set date from now. We appear to be experiencing an uptick in the number of target term CEF IPOs in recent years, with nine being launched last year. 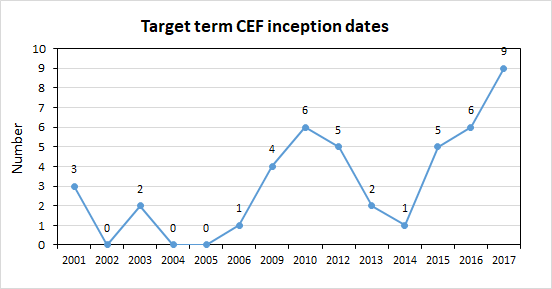 There are currently 44 term funds in CEFConnect's database, and the chart below shows the inception dates of each CEFs. Note that technically, this chart does not show the number of CEF IPOs per year because it excludes funds that have launched in the past but since been liquidated. 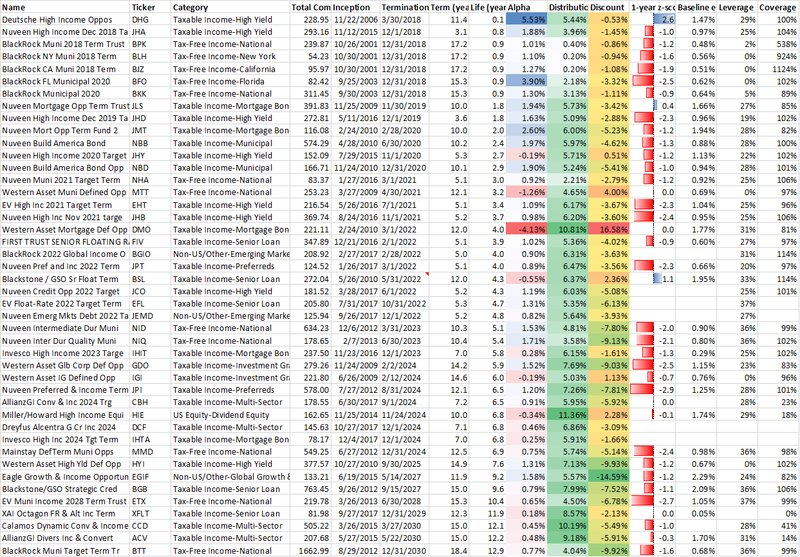 If we break down the categorization of the 44 target term CEFs, we see that the vast majority (42) are fixed income funds, and there are only two equity or equity/hybrid funds (HIE and EGIF). The leading category is national munis, with nine target term funds. Individual details of the 44 target term funds are shown in the table below. These are listed in ascending order of termination date (i.e., funds soonest to terminate shown at the top of the table). The table may be easier to read as a picture below with my color coding. The "Term" column in the table refers to the length of time between the inception of the fund and the termination date. The "Life" column in the table refers to the remaining time from now until when the fund terminates. The "Alpha" is calculated by dividing the current discount by the remaining life of the CEF. Some one-year z-scores, baseline expense ratio and coverage data are absent for some funds because they were only launched last year. Let me try and explain the alpha capture opportunity for target term CEFs in more detail, particularly for those who might be newer to CEFs. For target term CEFs, one would expect with reasonable certainty for the discount to close to par as the liquidation date nears. This is because when a CEF liquidates, the assets are distributed back to shareholders at their net asset value. Similarly, when a CEF converts to an open-ended structure, arbitrage forces will easily push the price toward NAV (since shares of the open-ended fund will now be able to be redeemed for the constituent stocks by authorized participants in the case of an ETF, or redeemed for cash at the NAV from the fund manager itself in the case of a traditional mutual fund). By dividing the discount by the remaining life of the CEF, we can calculate the annual alpha we expect to receive from holding the CEF vs. an open-ended fund holding the same assets. With regular (non term) CEFs, although we have exploited the concept of mean reversion quite successfully in our trades, there's no hard guarantee of the discount ever narrowing back to par. One very important advantage of some of these target term CEFs is lower duration (interest rate) risk. Note that this only applies to CEFs that have a targeted maturity. With a regular (non-target maturity) CEF, the bonds in the portfolio will fall in price as interest rates rise. Although technically the price of the bond should be recovered at maturity (assuming no defaults), the NAV of the portfolio cannot be guaranteed with any certainty at any future date because the constituent bonds are continually maturing and being replaced with new bonds. In contrast, with a target term CEF with a targeted maturity, as most of the assets are set to mature at or around the liquidation date, we have much greater likelihood of recovering an amount equivalent to the par value of the bonds when the fund matures even if interest rates are on the rise. The targeted maturity nature also has an indirect effect on lowering the credit risk of the portfolio as well, particularly for funds with only several years of life remaining. As bonds price in the cumulative probability of default until the maturity date, one would expect near-term bonds to trade with lower credit risk than long-dated bonds simply because it is mathematically less likely for a recession to occur within the next five years compared to within the next 10 years. How do we tell whether a CEF has a targeted maturity or not? I've found that the clue is in the name of the fund. If there's a stated year in the title, the fund is likely to have a targeted maturity. You also can check out the individual holdings of a CEF to confirm that they mature at or around the liquidation date. For funds that have a defined term but not a defined maturity, you have the alpha capture opportunity but not the advantage of lower duration risk. This is because when the CEF liquidates, the securities could still very well be trading below par, but the fund would have to sell them off anyway in order to return cash to shareholders. Duration risk works both ways. If rates unexpectedly U-turn and start trending lower from here on out, a target term fund (particularly a short-dated fund) will appreciate to a lesser extent than a long-dated fund. Target term funds will generally be lower yielding than regular (non-term) funds, simply because lower duration bonds usually yield less than long-dated bonds (as a natural consequence of the trade-off for reduced risk). As specified in the prospectus of some of the CEFs, the termination date can be extended. For example, Blackstone / GSO Senior Floating Rate Term Fund (BSL) announced last year an extension of the term by two years to 2022. Distributions are likely to be lower in the final year as securities mature and are replaced with cash alternatives. If you are concerned about this, I would suggest selling the target term fund before it reaches the final year of its life. Obviously, the fact that the discount narrows does not in any way guarantee that the underlying assets will hold value. If, for example, a financial crisis strikes before the liquidation date, some of the companies in the portfolio may go bankrupt and default on their debt, leaving less principal to be returned to shareholders when the CEF terminates. Finally, the bonds in the portfolios themselves may be trading above par, which will necessarily provide a headwind for the NAV as the bonds approach maturity. This is natural and expected because near-term bonds are inherently less risky than long-dated bonds and thus may be more likely to trade at a premium. For example, taking ETFs as the benchmark, the portfolio of Guggenheim BulletShares 2021 High Yield Corporate Bond ETF (BSJL) has an average bond price of 102.88, while the benchmark SPDR Bloomberg Barclays High Yield Bond ETF (JNK) has an average bond price of 99.80. With all of the explanation and caveats out of the way, it's time to reveal the hidden gemstones in target term CEFs. I define a "gemstone" as a target term CEF offering an annual alpha of over 1% a year. Is this a low hurdle? Well, many active fund managers would kill for an annual alpha of 1% is one way to put it. Another way to think about this is to consider that if the annual alpha exceeds the baseline expense ratio of the fund, you are essentially getting active management of the assets "for free." I'm going to exclude funds liquidating in 2018 as these will be currently in the "wind-up" phase and distributions are expected to be lower in the final year. 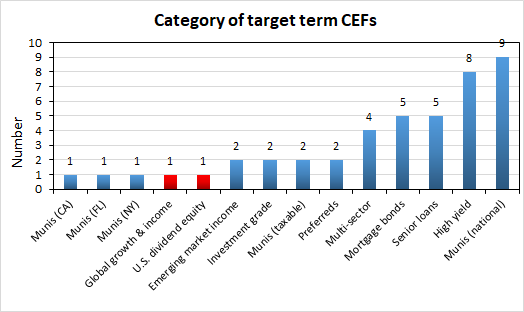 Here are the remaining 16 "gemstone" target term CEFs. Which of these "gemstones" do I find most attractive? In the mortgage bond category, Nuveen Mortgage Opportunity Term Fund 2 (JMT) looks pretty attractive with 2.60% annual alpha. It is set to liquidate in two years, on February 28, 2020. It trades with a yield of 6.00%, a discount of -5.23% and a one-year z-score of -2.3. For those willing to take on slightly more duration and credit risk in the municipal category and lock in a greater duration of annual alpha, consider Nuveen Intermediate Duration Quality Municipal Term Fund (NIQ) which will provide an alpha of +1.71% per year for the next 5.4 years until termination on June 30, 2023. The yield is on the low side at 3.58%, however. It has a discount of -9.13% and a z-score of -2.1. Nuveen Intermediate Duration Municipal Term Fund (NID) also is set to terminate in 2023 and it offers a higher yield of 4.81%, although the annual alpha is lower at +1.53%. It has a discount of -7.80% and a z-score of -2.0. Of the two senior loan "gemstones," both are set to liquidate in 2022. Eaton Vance Floating-Rate 2022 Target Term Trust (EFL) with its -6.13% discount has a higher annual alpha of +1.31% compared to First Trust Senior Floating Rate 2022 Target Term Fund (FIV) which has a discount of -4.02% and an annual alpha of 1.02%. However, EFL also is a very new fund being incepted only in July of last year, whereas FIV was launched at the end of 2016. Investors who like to wait for more visibility on their funds may therefore prefer FIV, despite being slightly better on a strictly quantitative point of view. EFL and FIV yield 5.35% and 5.36%, respectively. Finally, within the high-yield space I would prefer not to go too far out on the maturity curve. Eaton Vance High Income 2021 Target Term Trust (EHT) and Nuveen High Income November 2021 Target Term Fund (JHB) and appear to be very similar in many respects. JHB and EHT yield 6.17% and 6.20%, have discounts of -3.67% and -3.60%, z-scores of -2.3 and -2.4, and offer annual alphas of 1.09% and 0.98% respectively. Nuveen High Income December 2019 Target Term Fund (JHD) might be interesting as a short-term holding, as it liquidates in 1.8 years from now and offers an annual alpha of 1.63%. The fact that the Western Asset Mortgage Defined Opportunity Fund (DMO) can continue to trade at a high premium despite its term structure continues to defy rationality. With a current premium of +16.58% and a scheduled termination date of March 1, 2022, DMO investors are willing to subject themselves to a negative alpha of -4.13% per year for simply holding on to this fund. DMO is not a gemstone, it is a lump of coal. Sell it while you can! Besides DMO, only four other funds have negative alphas. Of those four, only MTT has a significant annual negative annual alpha of -1.26%. I would be a seller of MTT also. 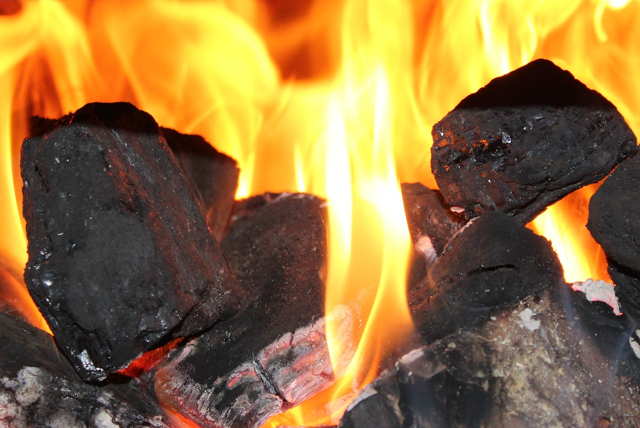 This article has discussed advantages and limitations of target term CEFs, and provided examples of gemstones and lumps of coal for your consideration. (Hint: consider buying the gemstones and avoid the lumps of coal). Do you invest in any target term CEFs and what is the strategy that you use with them? Share in the comments section below! If you have enjoyed my article, please click the "Follow" button next to my name to be alerted to my new free content! The Cambridge Income Laboratory is my Marketplace service on Seeking Alpha focused on income and arbitrage strategies for closed-end fund (CEF) and exchange-traded fund (ETF) portfolios. Members receive exclusive subscriber articles and an early look at public content with more actionable recommendations and ideas. To find out why one subscriber calls us a "one-stop shop for CEF research," join us by clicking on the following link: Cambridge Income Laboratory. Additional disclosure: I am long the portfolio securities.